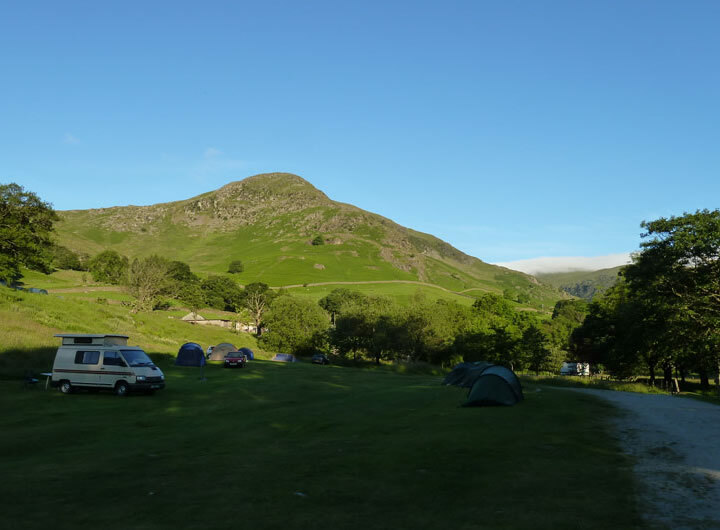 I booked in at Gillside Campsite, Glenridding late on Thursday evening. 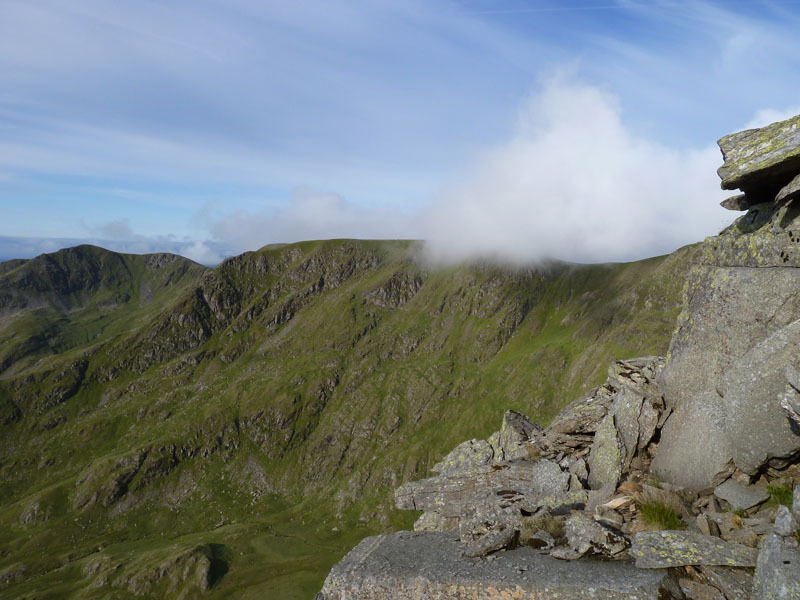 Early on Friday morning, my sights were set on Helvellyn. 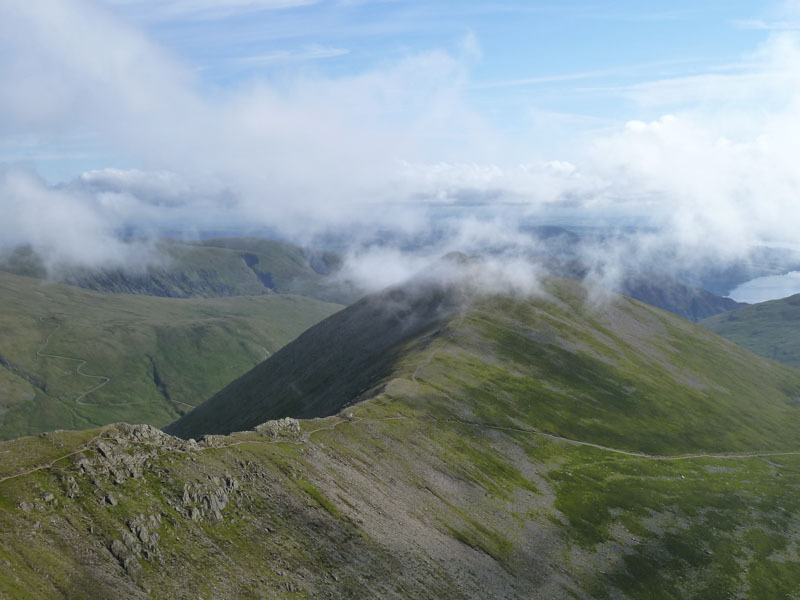 I generally ascend Helvellyn once a year nowadays and this was a great chance to renew my aquaintance with the highest felltop in "Eastern" Lakeland. It's 06:00hrs and time to go. I feel a bit fortunate as I went up to the Travellers Rest the evening before, enjoyed good beer and company and didn't get back to the tent until half past eleven, not the best of preparation. But the head is clear and after a bowl of Corn Flakes (other breakfast cereals are available), I'm ready for the off. 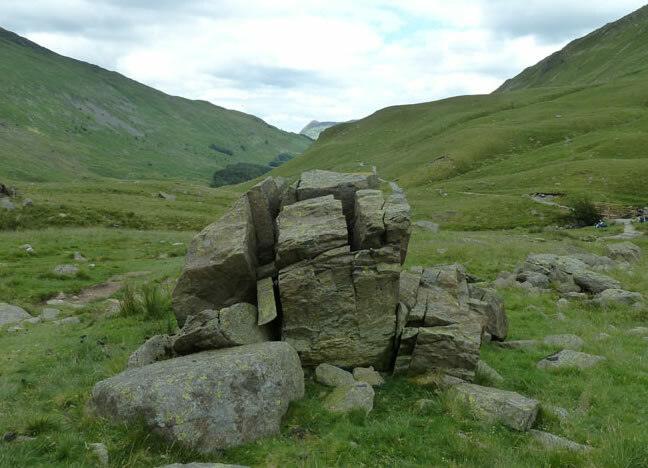 My route is up Miresbeck and onto Birkhouse Moor. 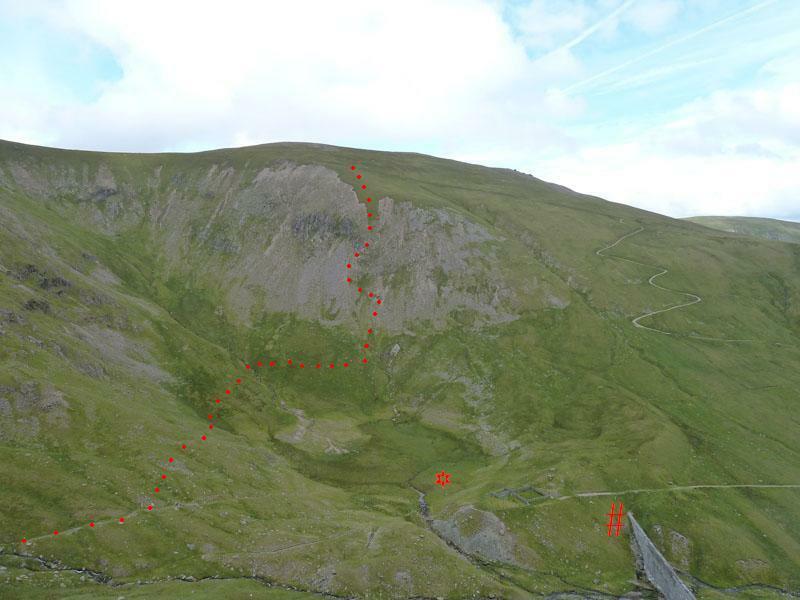 The ascent of Birkhouse Moor is inevitable using this route. 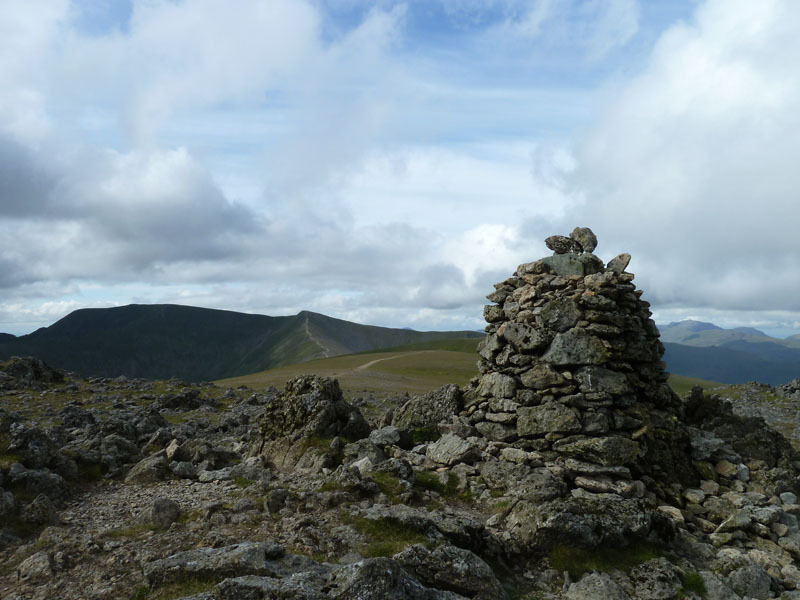 Wainwright notes that there is a cairn on BM which perhaps denotes the natural summit, but a higher point is on the fell, by the wall, en route to Striding Edge. Early morning cloud clings to Raise. 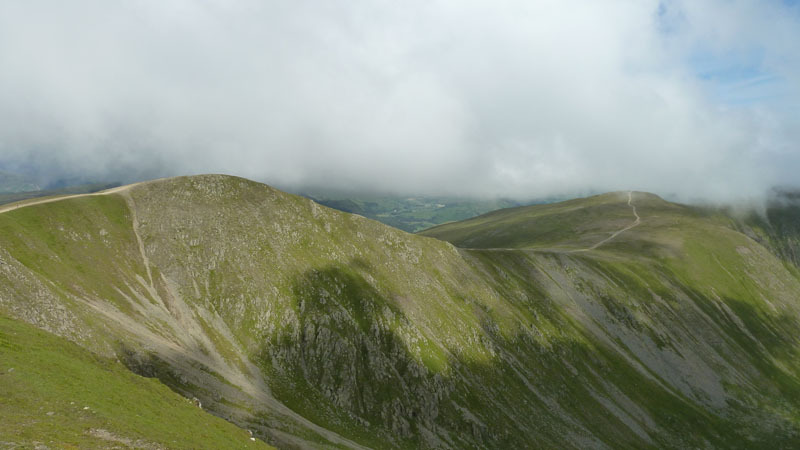 Catstycam is the pointed peak with a little cloud on top. I have it in mind to reach Raise in the course of time, but there is no firm plan. 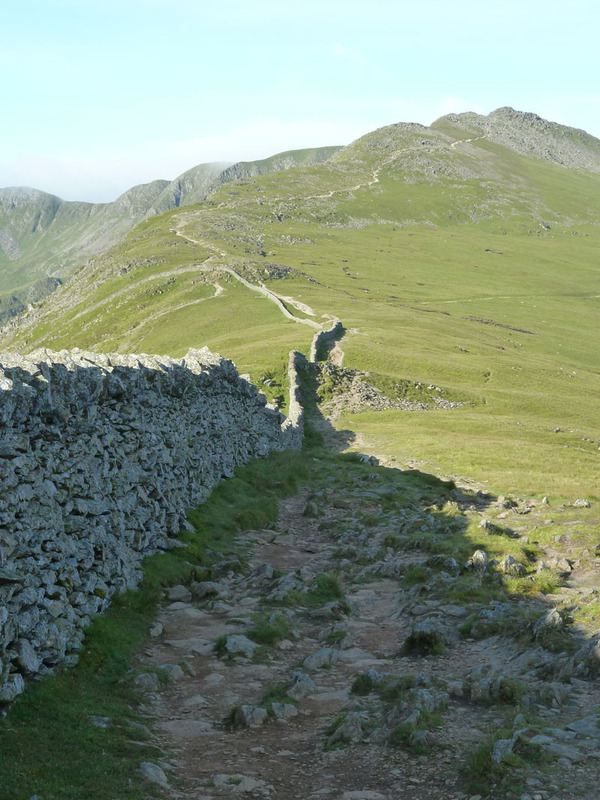 The path from Birkhouse Moor leads straight on to Striding Edge. 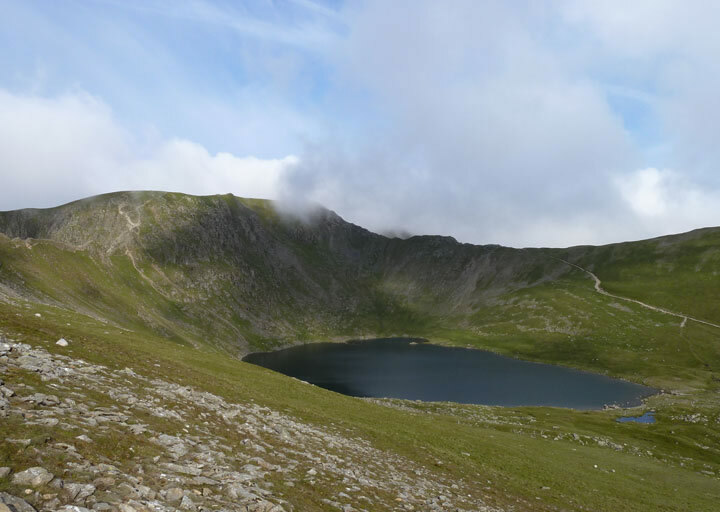 Red Tarn is host to two glacial aretes, Striding Edge is on the left (south) and Swirral Edge on the right (north). I think The Edge holds a mysterious wonder over all fellwalkers, at least until they have walked along it. 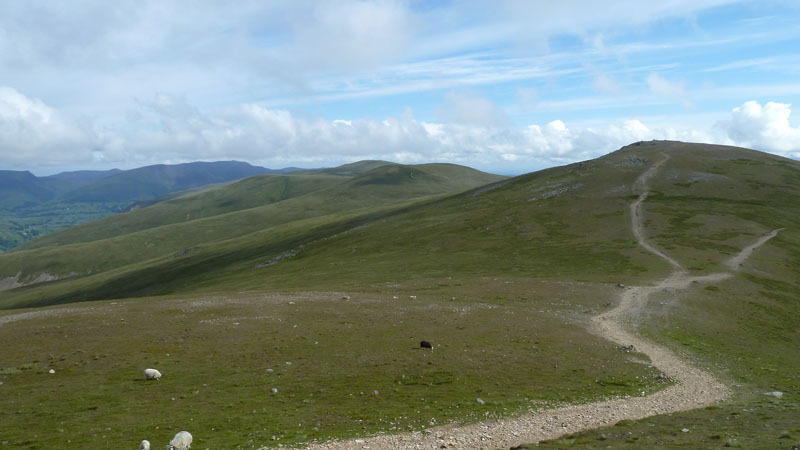 The pointiest bits can be avoided by taking the path below the ridge on the right. I no longer come here at busy times, the mess of walkers going in both directions is frustrating. At peak times, there should be a traffic light system, like they have in canal tunnels, allowing ascenders, then descenders a clear run. Looking back to the only difficult bit, but not that difficult. I've enjoyed having it all to myself in fine weather and no wind! 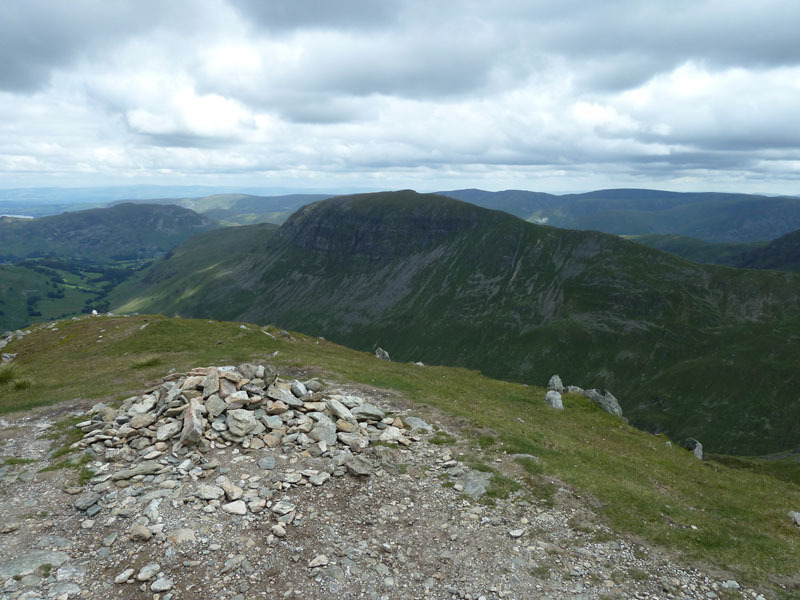 I was on top of Helvellyn, well at the shelter, by 08:20 and all was very quiet. So, I had a snack and watched the clouds drift by. Well, not that cross. I'm stood on the highest point. How many folk visit the shelter or maybe the trig point, but don't bother to go to the top of the mountain? Litter Watch: The shelter was largely clear of rubbish, just odd bits of tissue and wrapper. 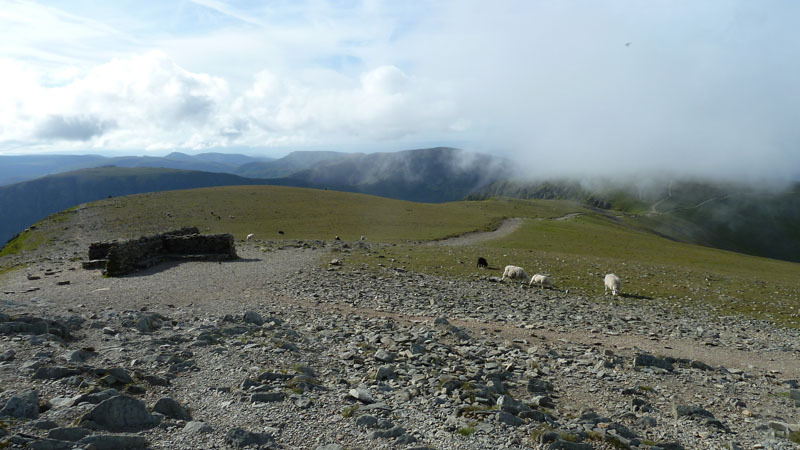 The first hello's to a few solitary walkers heading for Helvellyn. 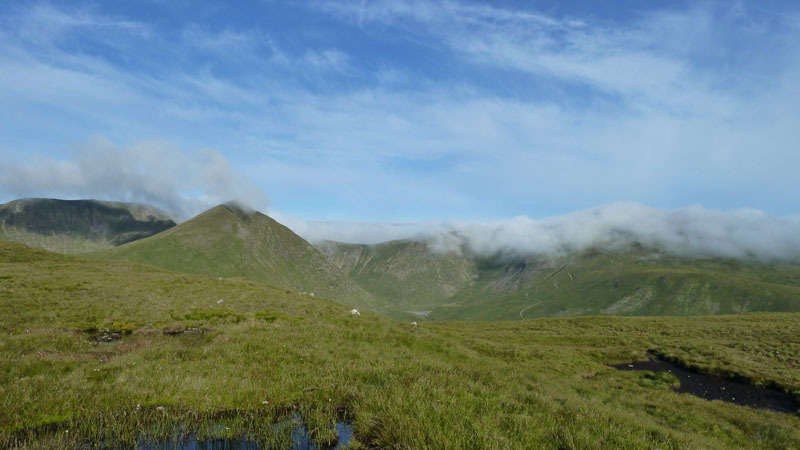 At this point I'm thinking of wandering along The Dodds to Clough Head, then maybe retracing my steps or alternatively catching buses from Threlkeld to Penrith and then Glenridding. Raise? The namers must have run out of names. 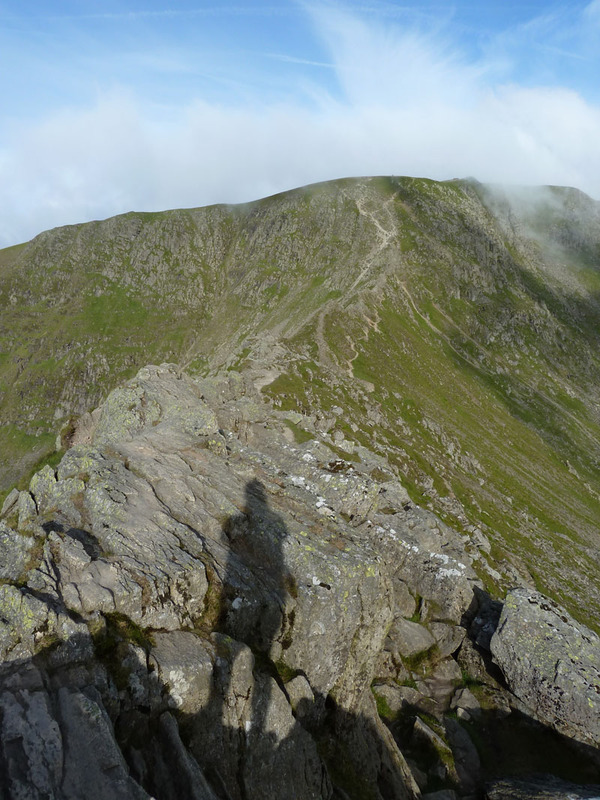 I've been looking at Catstycam, climbing Helvellyn and then along comes Raise. I decided it was map and think time. 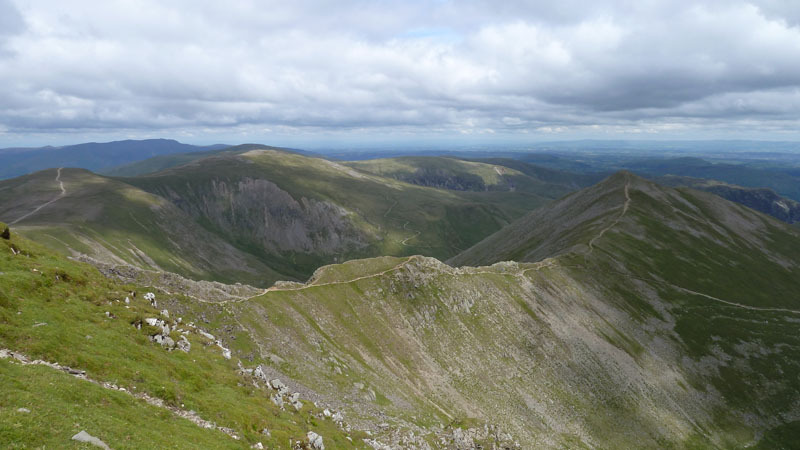 All the way along I've been looking at Catstycam, it was time to change the route plan. 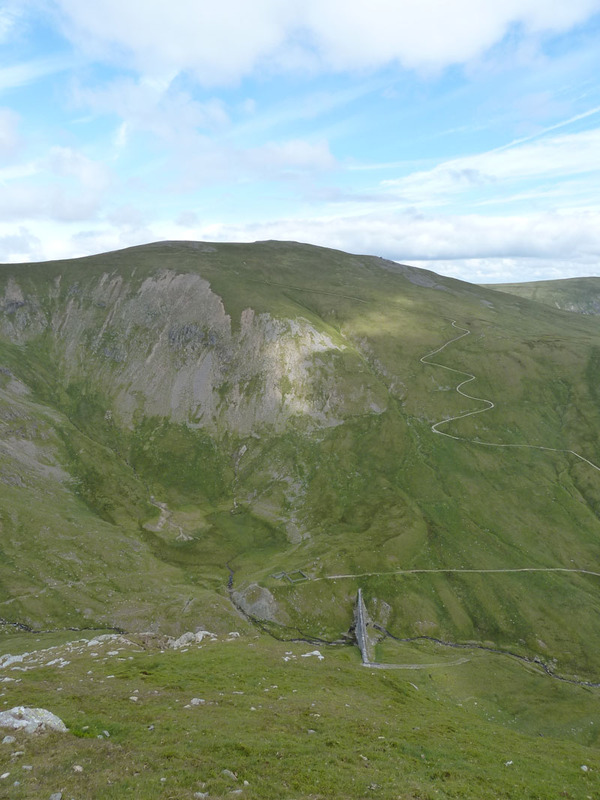 I chose to take a direct route down Raise to Keppel Cove. Not recommended, it's a bit steep and full of scree. Old reservoir and stuff. Some campers had been using level ground higher up the cove, behind me. I saw them earlier from White Side, but they had gone by the time I arrived here. 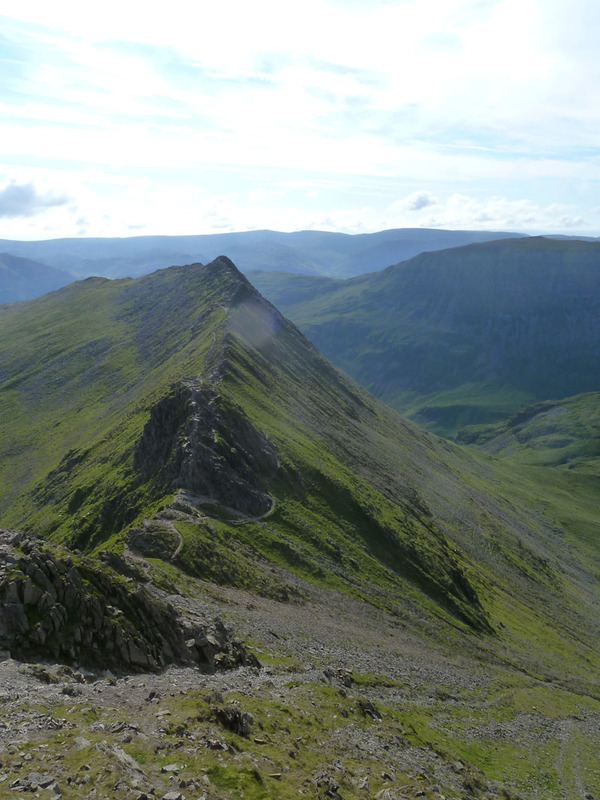 Now, it's the steep "red-blooded" challenge of Catstycam's North-West ridge. It's red dot time. That's roughly the route I took. 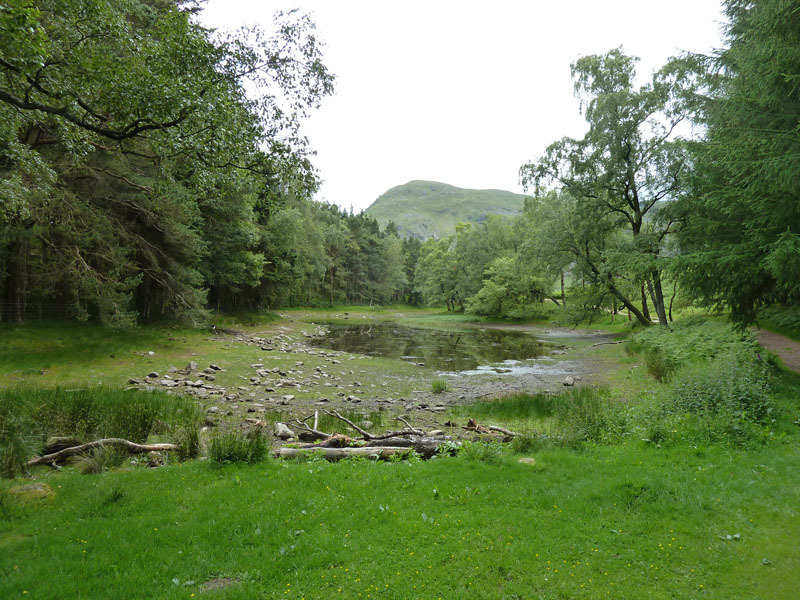 * is the dry Keppelcove Tarn, formerly a reservoir for Glenridding lead mine. # is the breached dam. 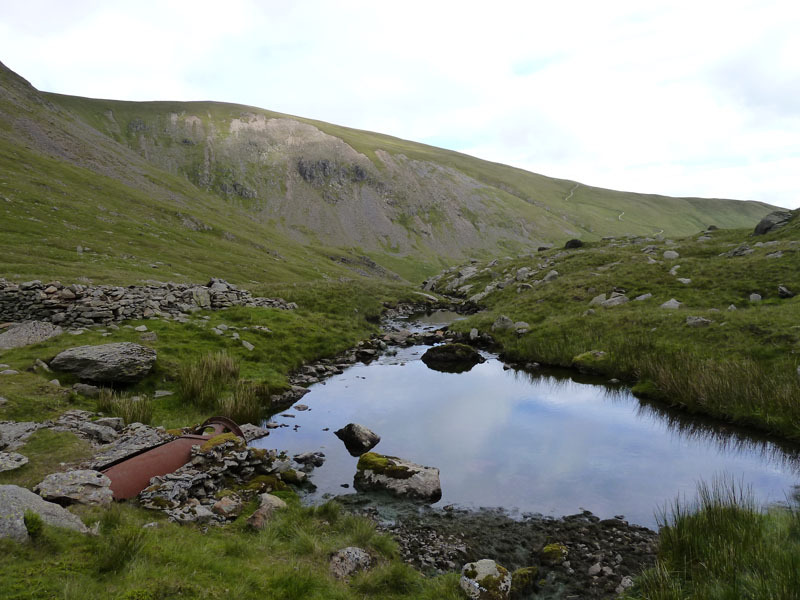 If Keppelcove Tarn was a natural tarn prior to industrialisation, could we not have it back? 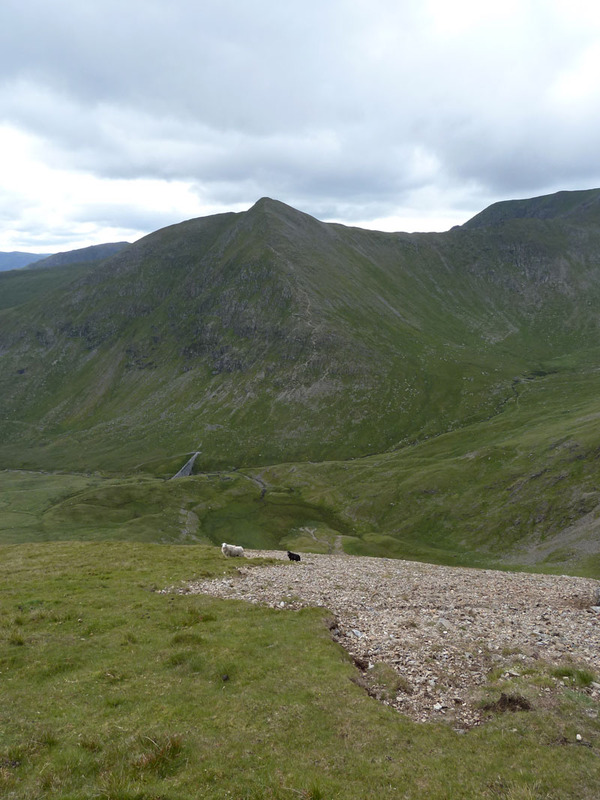 Wainwright describes this ascent of Catstycam as "an easy uphill walk without any difficulty other than steepness" Fair enough, but nowadays the path is very loose having been well-worn by many thousands of boots. Well, now I'm here, I may as well head back to Helvellyn for a look at her neighbours on the south side. 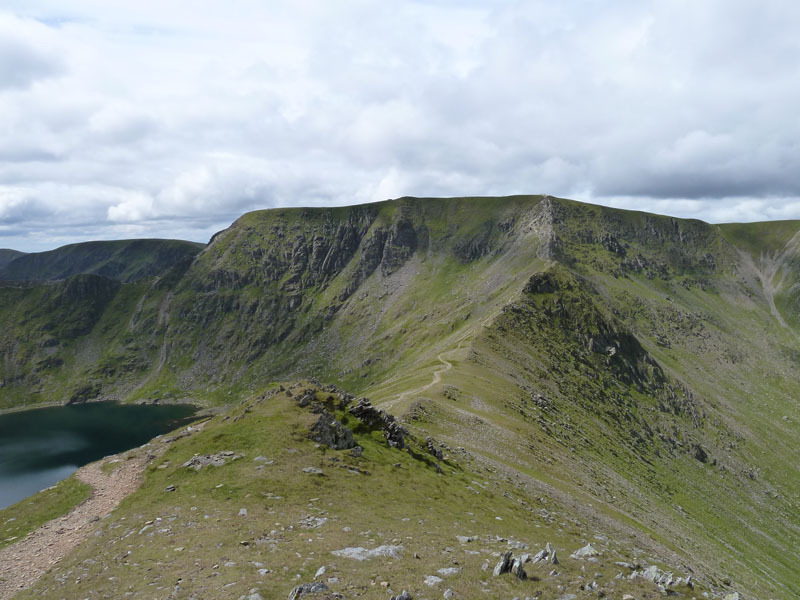 Not too many folk will climb up to Helvellyn using both edges on the same day. Such is the air clarity that I espied an old friend from many miles away. 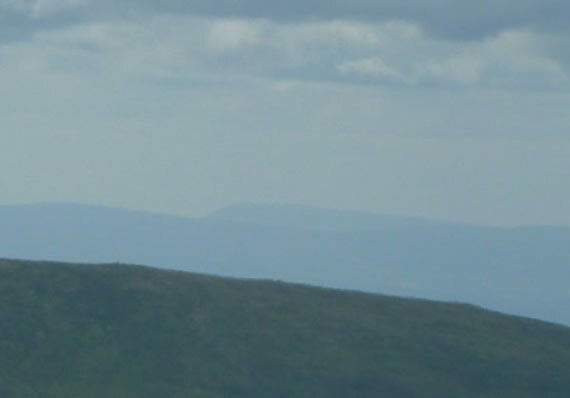 I think the near ridge could be part of Caudale Moor. Busier up here now, but not too busy, it's still Friday. 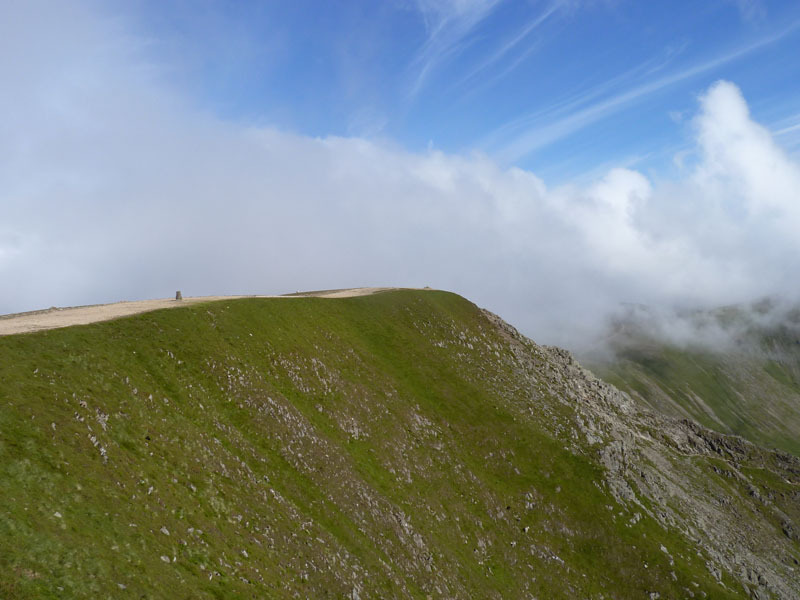 It' about four hours since my first visit to Helvellyn Summit. 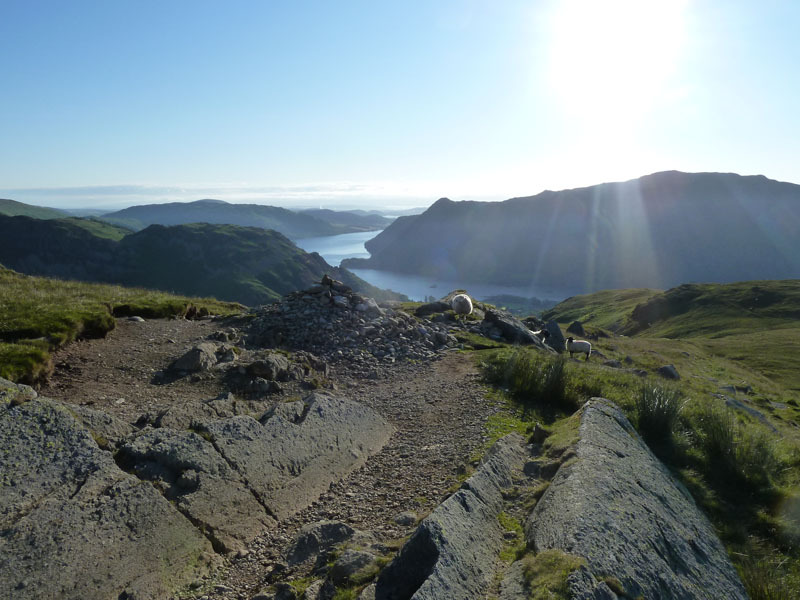 The left-hand path goes to the highes point on NP, the middle one heads for the bigger cairn on High Crag and the right-hand one heads to Birk Side and the car park near Wythburn by Thirlmere. That'll be my route back to civilisation. 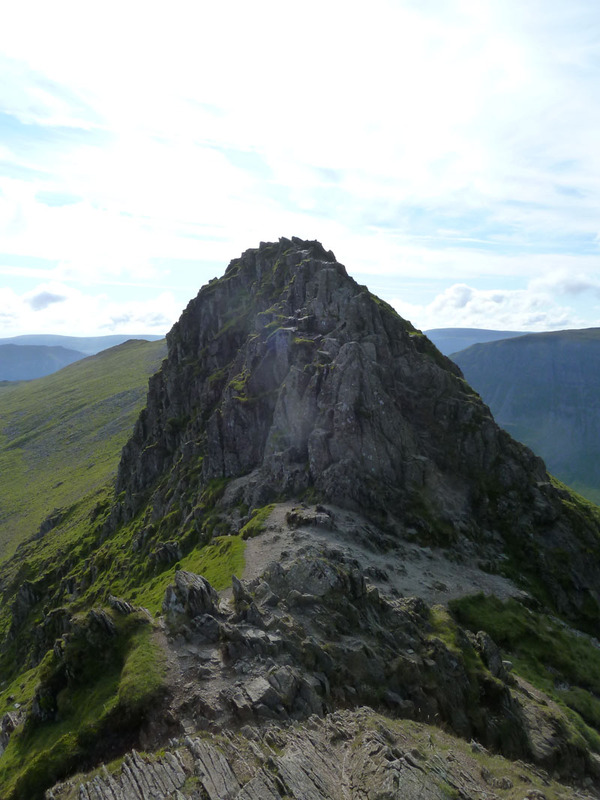 St.Sunday Crag dominates the view. 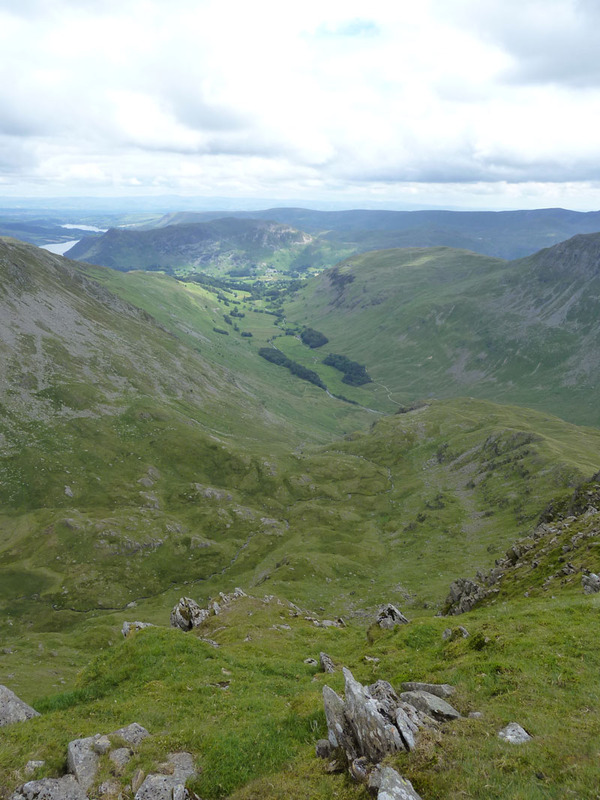 Now it's time to descend the zig-zags to Grisedale Tarn. 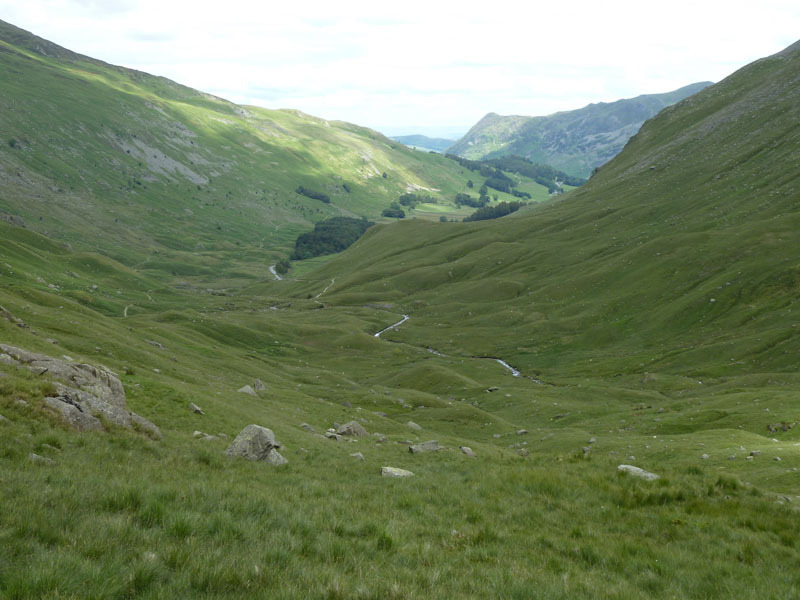 My route took me over the hill known as Keldas, past Lanty's Tarn and down to Glenridding. After refreshments, it was back to the campsite. 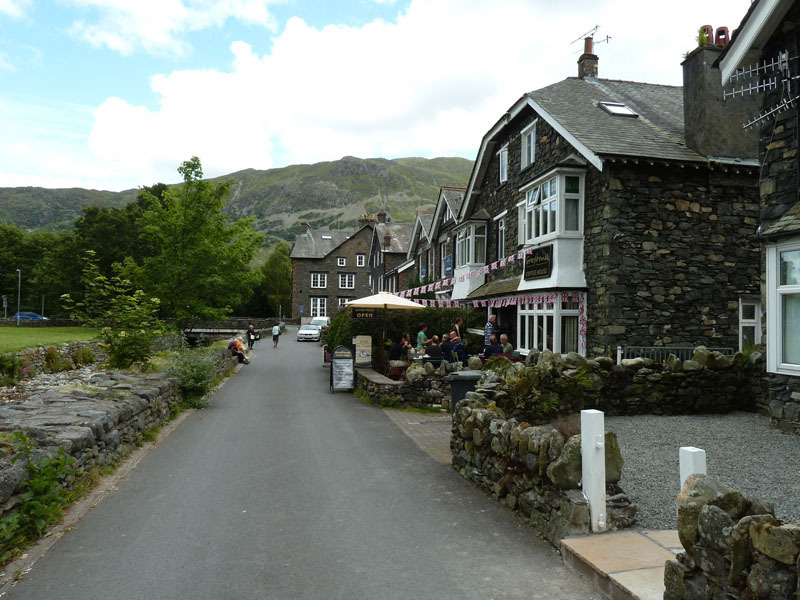 £7 to park in Glenridding; £9 gets you all day parking plus a night's accommodation at Gillside. plus 20p for a shower. Time taken: 9hrs 15 mins over a distance of about 14 miles. 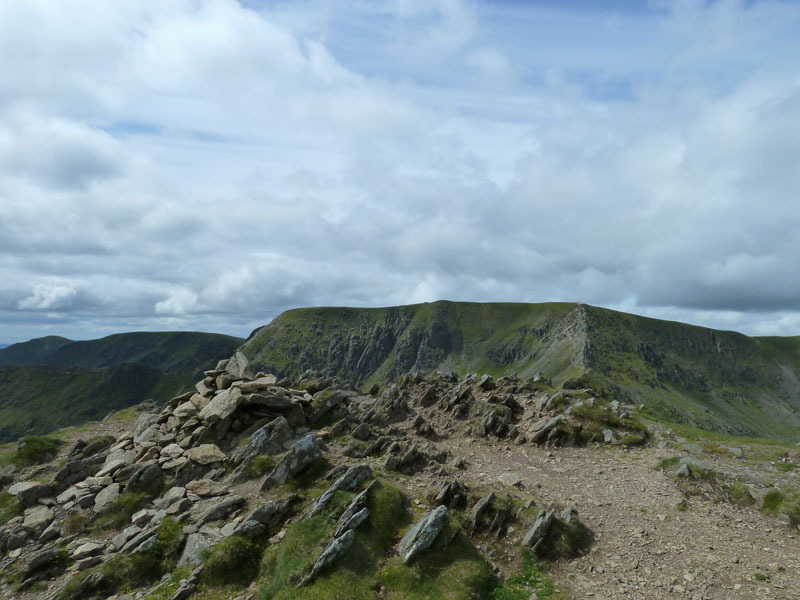 Route: Gillside Campsite, Mires Beck, Birkhouse Moor, Striding Edge, Helvellyn, White Side, Raise, Keppel Cove, Catstycam, Swirral Edge, Helvellyn, Nethermost Pike, Dollywaggon Pike, Grisedale Tarn, Grisedale, Keldas, Glenridding, Gillside Campsite. Weather and conditions: Sunny Intervals and Warm. 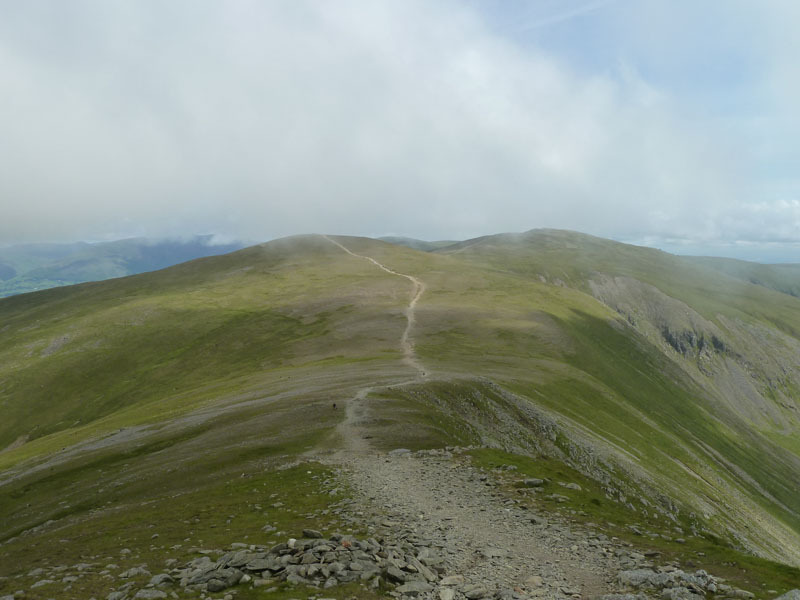 Greetings Count: First nod was on the way to White Side, no more until Catstycam - and that was a runner! 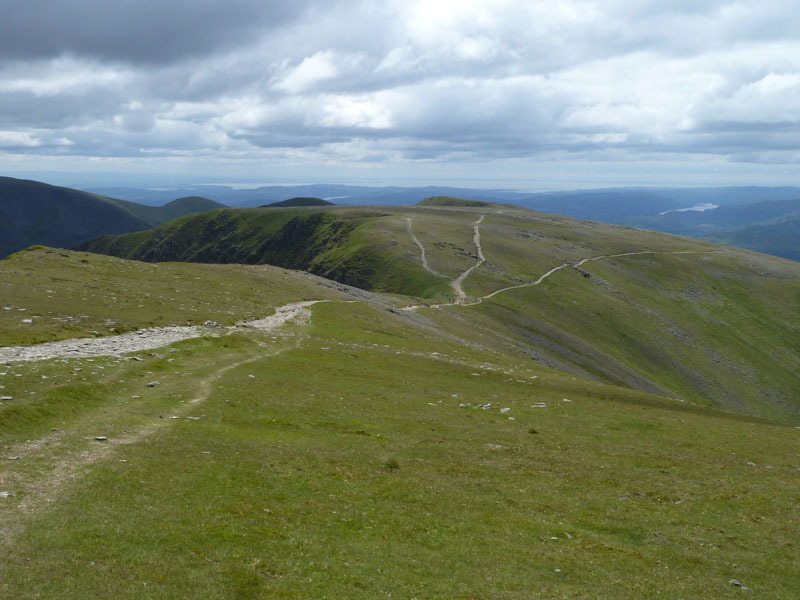 Next and most activity was back on Helvellyn and then a few more walkers on the way down. Richard's Refreshment Review: Tea and cake at Greystones. New owners? I think it was for sale last time I was here. If I am to be honest, and that's the only way - tea was OK (prefer extra hot water, not offered), but the cakes were a bit pricey.